Jacob Hanna/Pipe Dream Photographer The Literati Reading Series, held at Atomic Tom’s on Oct. 19, featured poet and critic Raymond Hammond alongside Binghamton University graduate student Kayla Hardy-Butler. 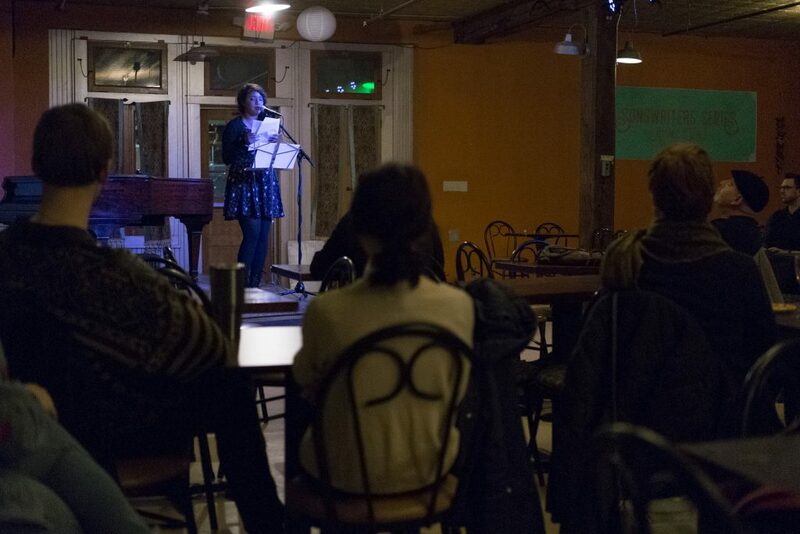 The second Literati Reading Series event of the semester was held Oct. 19 at Atomic Tom’s in Downtown Binghamton. The series, run in partnership between the Binghamton Center for Writers and the Broome County Arts Council, works to pair well-known authors with Binghamton University creative writing graduate students for free readings. This past reading featured poet and critic Raymond Hammond and second-year graduate student Kayla Hardy-Butler. Hardy-Butler is studying within BU’s English department and is specializing in fiction. Her research interests also include screenwriting and African diaspora literature. At the event, she read two abridged chapters from her upcoming dissertation, a novel centered on race that takes place during the Antebellum period. The novel deals with a slaveholder and his two sons, one white and one black, who both fall in love with the same girl, a mulatto slave who gets captured. The brothers pose as master and slave during their travels. “After you read something from a kind of Antebellum superhero like that, it stays lodged in your head, thinking of all these different, really weird — Southern Baptist, and church, and Lincoln and all these political rallies he had to navigate — it kind of rings scarily true to today,” Hardy-Butler said. Hammond was the featured reader of the evening. He read a collection of poems from his not-yet-published “Crows Crouched.” Most of the poems revolved around religion, with other more observational and nature-centric ones dispersed to counterbalance the heaviness of the religious material. Hammond acknowledged his upbringing as a Southern Baptist and his effort to break out from the group as an influence on his writing. Like Hardy-Butler, Hammond also noted the relation between his work and recent current events, citing the 2016 presidential election as the moment he began working with his collection of poems as a whole. Daimys Garcia, a second-year graduate student studying comparative literature, commented on the larger aims of the Reading Series, which involve bringing the University and the community together and offering graduate students opportunities to network with published authors. The next Literati Reading will feature poets Adam Gellings and Leah Umansky and will take place at 7 p.m. on Nov. 16 at the Phelps Mansion Museum.